Give us a call today to learn more about shingle roofs and how this option can benefit your Orillia, ON home. Whether you are building a new residence or looking to replace the roof on your current home, you may be considering several options. Shingle roofs come with a set of advantages that make them one of the top choices for residential properties in Orillia, Ontario and elsewhere throughout the country. While some other materials might be more durable or last longer than asphalt shingles, the main benefit of choosing shingles is that they are the most cost-effective option. They also provide plenty of protection from snow, rain, wind, and other elements, while looking visually appealing. Fibreglass shingles have thick coatings to make them waterproof and add durability. They also protect against the risk of fire. Shingle roofs will also last for up to 15 years with a low upfront cost, so they are budget-friendly and much more economical than other types of roofing materials. You can choose from various styles and designs to make sure your roof fits with the style of your home, whether you like a modern look or want to stick with a classic style. 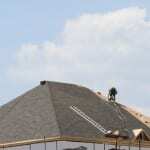 At Slippery Slope Roofing, we offer installation and repair of shingle roofs in the Orillia, Ontario area. Our owner and foreman have 50 years of combined roofing experience and pass their knowledge onto the rest of our team members when providing extensive training. Give us a call today to learn more about shingle roofs and how this option can benefit your home.